The various differing forms, colours and standards of domestic electric cables can lead to a seriously confusing landscape for the average homeowner. So here we demystify this landscape in a bid to literally untangle a range of cables that you may be dealing with for your DIY or professional project. The standard for domestic electricity supplies within the UK is 230 volts AC, and whilst the Building regulations Part P act 2005 made it illegal for non-professionally certified persons to undertake electrical installation work, the information presented here can serve to be a useful point of reference. It’s also worth noting that when employing a professional all work must be certified when complete by your local Building Control Department. Whilst the EU has been responsible for much change as to the colours and standards that Electrics cables now run to, they have been put in place to improve the understanding of individuals in which cables they’re working with. Today the majority of domestic electrics cables adhere to British Standards BS 6004, with a complete new colour code brought into effect as of the 31st March 2006. Cables that feature a solid core should never be re-purposed after use for a further project (this is down to the way in which the cables flex and bend, which can lead to damage when flexed repetitively, as it can weaken the core - leading them to fail). Twin core and earth cables are those utilised for general internal power use. They include two insulated solid cores with bare copper within the centre, covered within PVC. The core to current and wattage ratings are listed below. 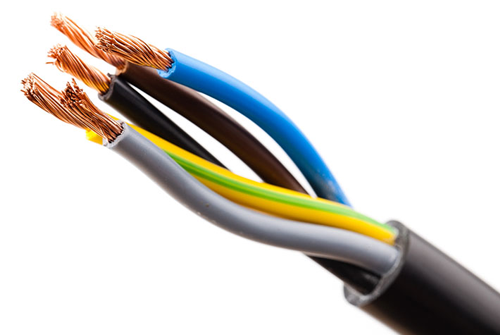 For homes that haven’t undergone an electrical refit older cables may still be in place. These would be rubber insulated, two core covered with an outer lead lined sheath. If you come across any such wiring it should be replaced as soon as possible as over the course of time this rubber has been known to break down and lead to failings or fire. What’s more such a system is unlikely to have modern safety features, such as trip switches. Strands that are breaking off – such a situation will mean that the cable is unable to carry the current, which will lead to overheating. Earth wires that have frayed and twister together – this common method of installing such cable served little purpose but has later been found to be a danger. 3-core and earth cables are usually found between two switches and are made up from three solid cores coated in a PVS sheath, accompanied with a copper earth conductor. Armoured cables are generally used when power is to be transported either within the ground, or overhead, they generally consist of inner cores which are coated in PVC and then protected by a further plastic sheath which covers all inner cores. There may be anywhere between two to four cores within such a cable, how many will depend upon the exact use. Armoured cable, over and above all other electrical cables, commands meticulous installation as the safety implications for an incorrect installation are particularly serious.